I always keep a look out for interesting mugs. The more random the better. It is a bonus if the mug is Christmas themed! Throughout the holiday season, I indulge on hot drinks. Cider, chai, tea, hot chocolate, egg nog, and flavored coffees I love them all! I cherish the few cold nights we have in South Mississippi. You can see the extent of my love on my December Daily Instagram feed. 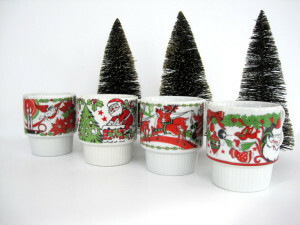 This fun finds is a gallery of Etsy Christmas mugs that I admire, and would love to have on my coffee table this holiday season! 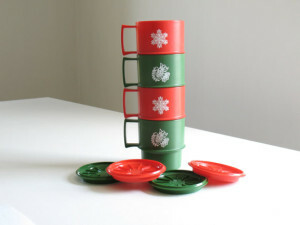 This stackable tupperware set could last for many Christmas parties to come! 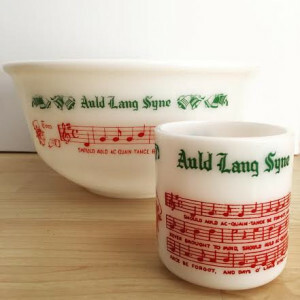 All is merry and bright with these mugs! 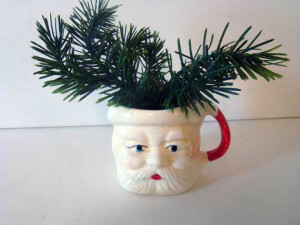 Saw a mug like this at a Thrift Store in Ohio, and was immediately curious. These work for New Years and Christmas. 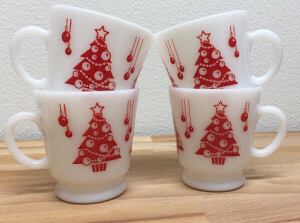 Milk glass is so classically vintage, and so are the Christmas trees. 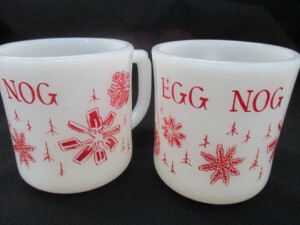 Cannot go wrong with a vintage cup of egg nog. 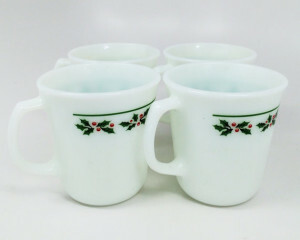 These classy holly mugs would look great next to the coffee maker on Christmas morning. 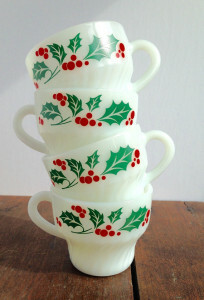 This holly set is made by a brand called Termocrisa that is as durable as pyrex. It is not the holiday’s in the Hornsby house without a santa mug! 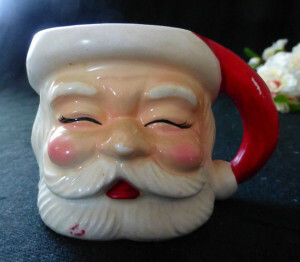 Another great santa mug with character and charm. 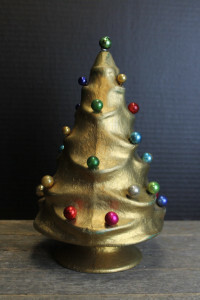 Thank you to my new friends on Etsy for allowing me to feature your shops this week! 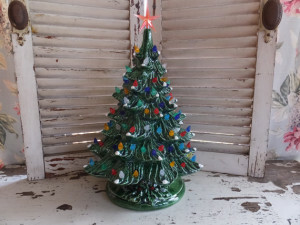 Last week, my grandmother gave me one of her many vintage ceramic Christmas trees. It is photographed in my last post and is so cute on our buffet. These trees are such great nostalgic reminders of the past. When I started looking at them awhile back on Etsy, I realized they come in any style imaginable. Here are a few of my favorites from my new friends on Etsy just click the picture to get a closer look! 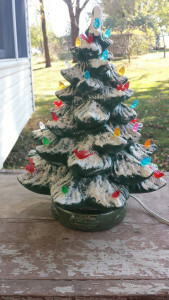 Who does not love a classic flocked tree? 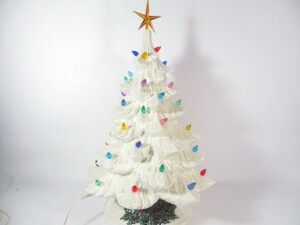 What a sweet white tree with a variety of lights. 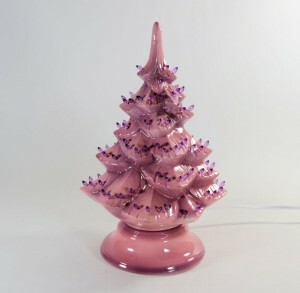 I know this tree is not technology ceramic, but it is vintage adorable! 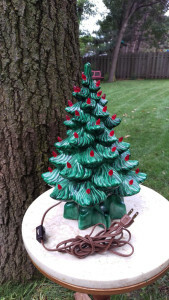 Thank you to the following shops for allowing me to feature their products in this post: CindysCozyClutter, beadsbymavis, DeliciousCastle, MyBarn, PherdsHolidayFinds, and RedsRustyRelics.